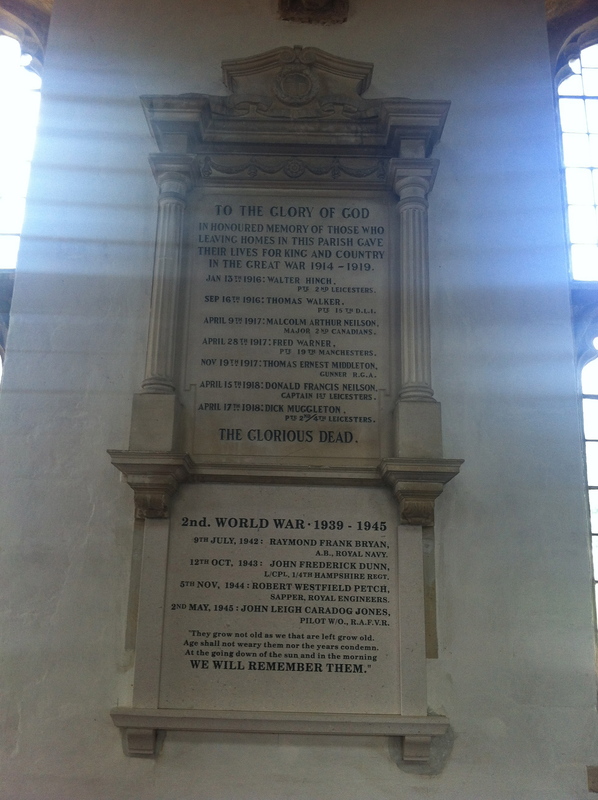 The war memorial at the Rutland village of Lyddington includes seven names from the First World War. Among them are private Walter Hinch of 2nd Battalion, Leicestershire Regiment whose name appears on the Basra Memorial in Iraq. There are also two brothers, 23-year-old major Malcolm Neilson of the 2nd Battalion, Canadian Infantry, who was killed near Arras in 1917 and 25-year-old captain Donald Neilson. The Lyddington memorial states the latter was a member of 1st Battalion, Leicestershire Regiment, but the Commonwealth War Graves Commission lists him as serving with 3rd Battalion, Lincolnshire Regiment when he was killed in Flanders in 1918. Among the Second World War names is that of 29-year-old John Leigh Caradog Jones, who died in India in May 1945. He was the son of Lyddington’s vicar. This entry was posted in Events and tagged Canadian Infantry, Centenary of the First World War, Centenary of World War I, Donald Neilson, Lyddington, Malcolm Neilson, memorials, Rutland, Soldiers of the Great War, Walter Hinch. Bookmark the permalink.